The poster art for the documentary film Under an Arctic Sky shimmers with a blurry green light on a jet black sky, the signature of the aurora borealis. A description follows: “A film project documenting the journey to the most remote corner of Iceland in the middle of winter in search of perfect surf.” I figure it will either be great or it will put me to sleep on this cross-country flight. A win either way. I watch the whole thing. And this is the gist: Professional-surfer-dudes-turned-filmmakers decide that filming the epic waves of Maui’s North Shore is tired material, so they reach out to their comrades around the globe in search of the next craziest place to surf. They settle on Iceland, in the dead of winter, and end up filming during one of the worst storms in the nation’s recorded history. If I had to guess, I’d say 10% of the film was surfing-related, 70% involved driving Land Rovers in a snow-driven hurricane, and 20% was dudes looking either anxious or excited about their prospects of survival or surfing, respectively. But as I watched, feeling cold, I realized something: Had the film’s director, Chris Burkard, not chosen somewhere so remote and forsaken, it is unlikely this film would have ever been made. As it turns out, surfing the final frontier is much more marketable than shredding sunny Huntington Beach. 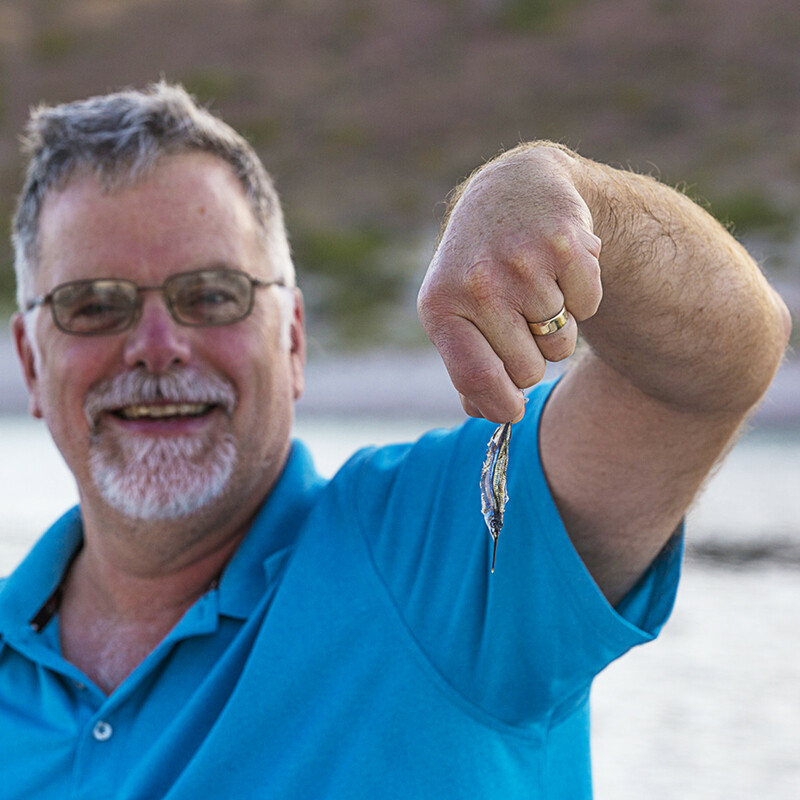 Larry displays the only fish we caught in four days on the water. This final frontier is something that Larry Graf—from Aspen Powercats (and Glacier Bay Powercats before that)—knows all too well. I settle in for some background research: A YouTube video is 27 minutes long and ends with Larry and his son, Nick, spraying champagne around like they just won Olympic gold. The video is from 2014 after the father-son duo finished the 640-some-mile nonstop circumnavigation of Vancouver Island in what was then record time. 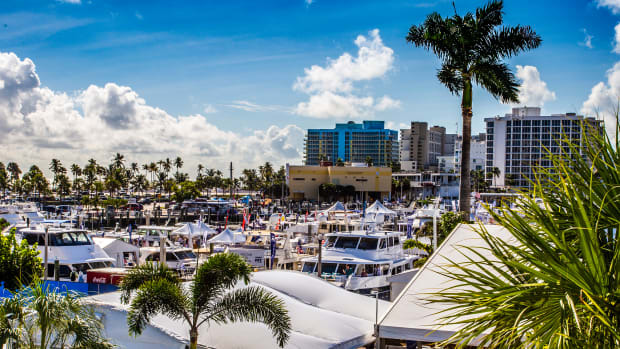 The event, the inaugural “Pacific Challenge,” was sponsored by Pacific Yachting magazine. 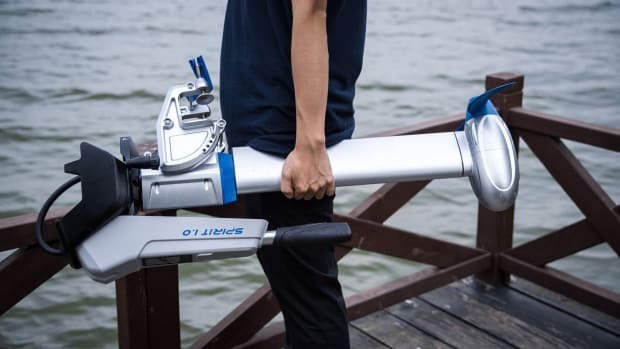 The editors of the British Columbia–based publication thought it would be enjoyable to pit local builders against each other to see who could build the fastest yet most efficient boats in the region. A rough and exposed circumnavigation of Vancouver Island would weed out any wannabes. For those who don’t know him, Larry Graf is not one to turn down a challenge. In fact, for decades he has been the one presenting them, which makes me wonder if this whole event wasn’t his idea from the outset. Nevertheless, with their dark blue Aspen 32 outfitted with a custom aluminum fuel tank in the cockpit and a bevy of intrigued sponsors at their back, Larry and Nick made mincemeat of the competition. Total elapsed time: 47 hours, 5 minutes. Fuel burned: 267 gallons (5.6 gallons per hour at an average speed of 13.6 knots). Sure, it could be done again. And it was done (even faster), but that’s not the point. Larry jumped on it, won it, and the trophy was Aspen’s to hoist high. Norris, Larry, and Nick (left-to-right) inspecting an anchorage for the second night at Isla Partida. This wasn’t Larry’s first rodeo, not by miles. He’d been doing this, a thing loosely called “adventure cruising,” for nearly two decades, and he’s still at it. He does it for three reasons. 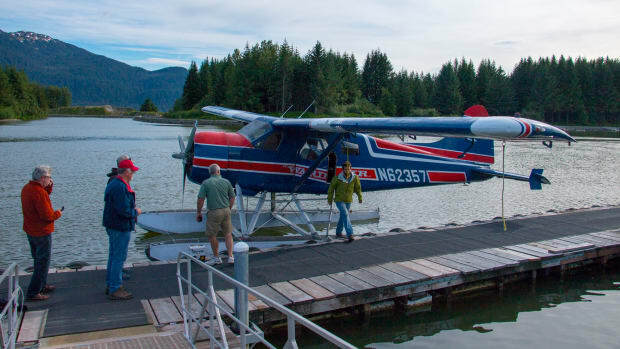 One, he knows that the boats he builds—first with Glacier Bay and then with Aspen starting in 2007—perform safely and efficiently in a wide variety of sea conditions. Two, he clearly understands the value of unique publicity. And three, he absolutely cannot help himself. Twenty-three years ago, Larry sought to prove that his boats could do anything the big boys could do. 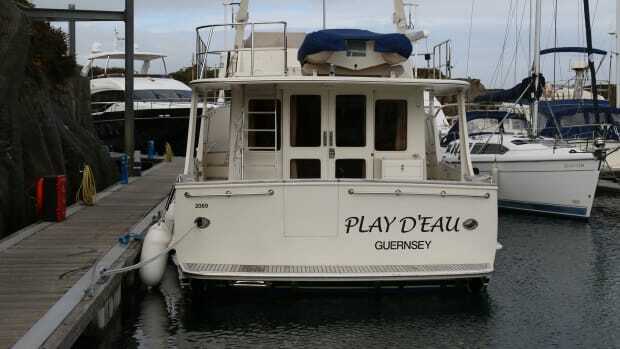 And to show the world what he meant, he set up challenges that the boating media would devour. It wasn’t about being a showman; it was pure marketing genius. 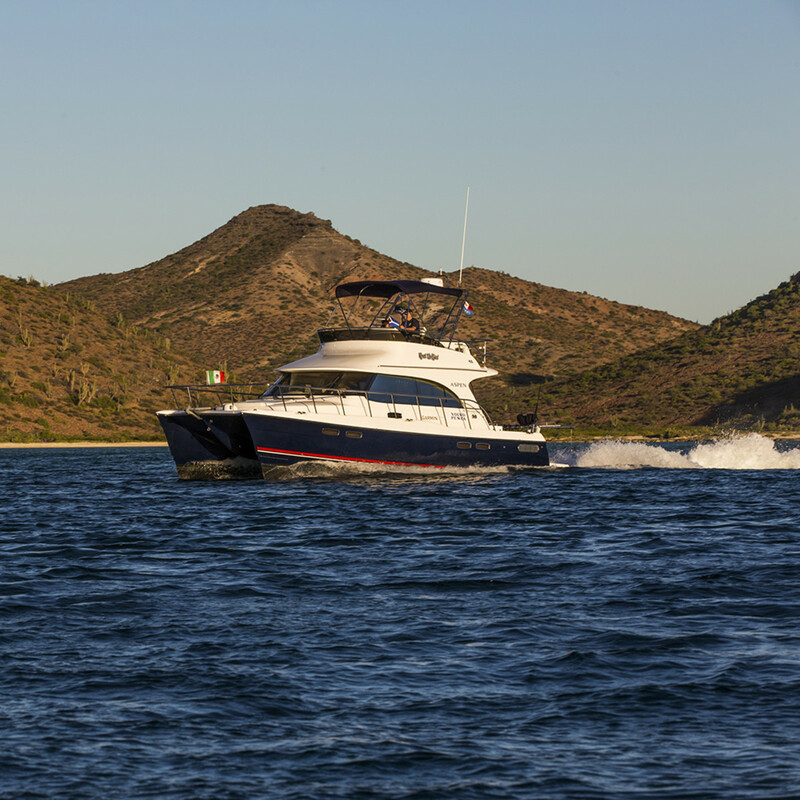 Aspen 40, Knot Wafflen’ just north of La Paz, BCS, Mexico. In 1999, Larry answered a call from David Seidman of Boating magazine. Urged on by Tim McKercher at Sea-Doo, the world-famous waterbike fabricator, Seidman had devised a harebrained scheme to take jet skis across the Bering Strait. They would depart Nome, Alaska, and the plan was to make landfall 180 miles away on the Russian island of Diomede before returning to U.S. waters. Since the island was too far for the Sea-Doos’ range, Larry was called in to assist with extra fuel, survival suits, electronics, and, I suppose, morale. Larry was there at the ready, a photo shows him standing on the bow of a 26-foot Glacier Bay, the boat snug up against a berg, with a film crew on hand to document the adventure. It’s no accident that Seidman phoned Larry. On several previous well-publicized ventures, Larry had proven himself to have an unquenchable thirst for danger. 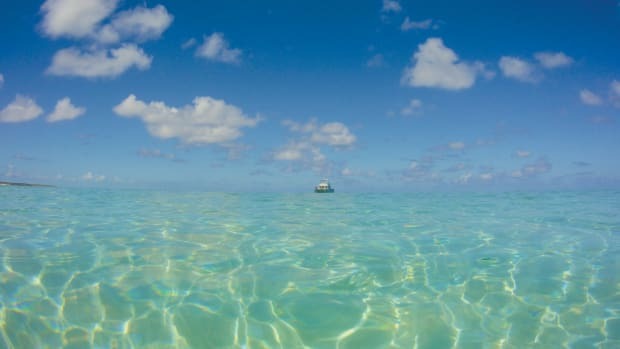 In 1995, he and a crewmember established the record time for a nonstop trip from New York to Bermuda. 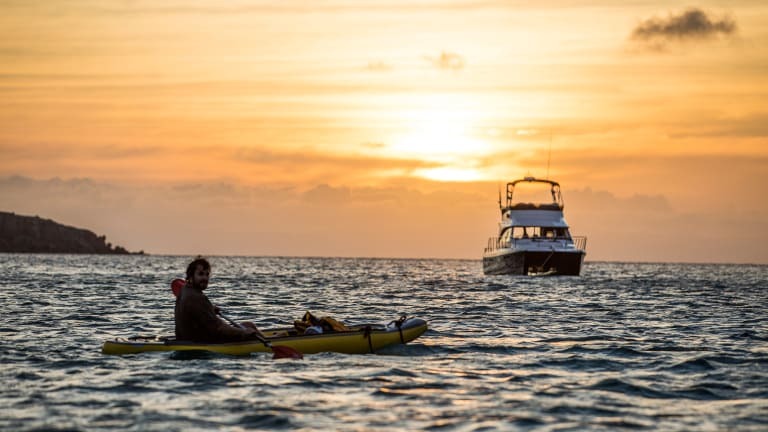 Three years later, he and a few colleagues delivered two outboard-powered 26-footers from Hawaii to the Midway Atoll, stopping just once for fuel on the 1,328-mile trip. Nick, at the helm, and Larry, in the foreground, on the flybridge. 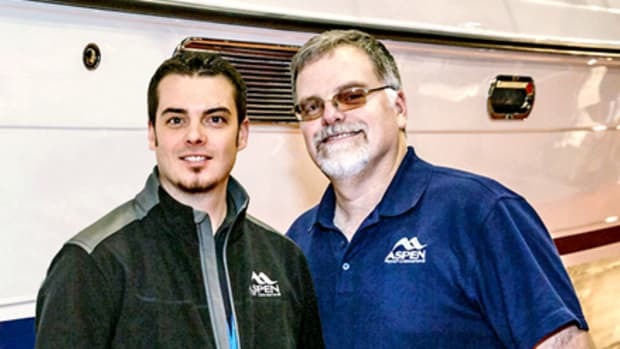 Aspen’s team is a tight-knit group, and that extends to non-family members, too. 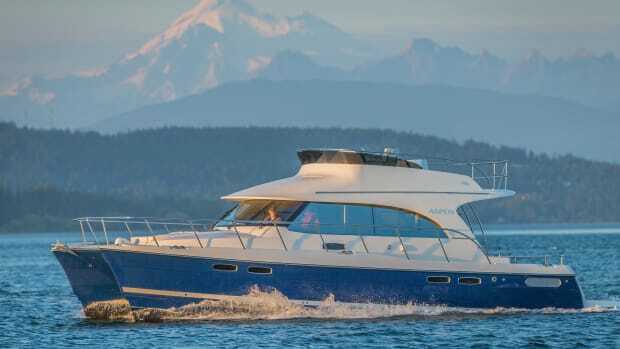 In 2007, Larry left Glacier Bay to start up a new venture, Aspen Powercats, with a new factory in Burlington, Washington. 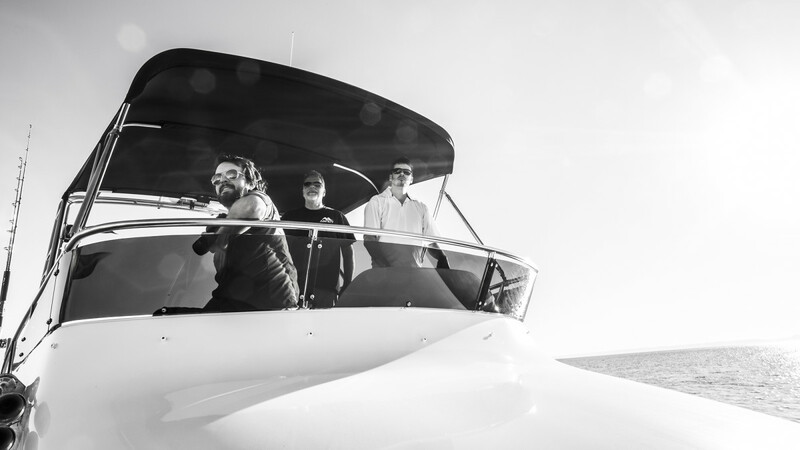 Two years later, just as the economy was showing signs of crashing, the Aspen team was in the midst of developing tooling for their first proa catamaran mold. On my tour of the facility, Nick told me that oddly enough this timing was just about perfect: “By the time we had finished the first boat, the economy was recovering enough that we could build the next in line without too much worry.” And with that, Aspen was off and running, starting with the 28 and 32, and moving up to 40-footers with the launch of the successful C120 in 2016. Like many small and medium-size boatbuilders, Aspen is a family affair. Most like his dad in terms of gregariousness, Nick primarily handles sales. But his brother Steve and their sister, Chrissy, are also involved in day-to-day operations, handling marketing and events, among other things. Even Chrissy’s husband, Brandon Holmes, has joined the team to help on the manufacturing side. Having visited the Aspen factory, I can say that a tour is well worth it. Nick is a natural tour guide, and as you would expect, the yard is a reflection of its owners: busy, friendly, not stuffy or pretentious. Aspen C120, Knot Wafflen&apos; at anchor as the sun sets. The most recent feather in the Grafs’ cap is the Aspen C120 Knot Wafflen’, owned by David Jenkins, the ready-waffle magnate, and his wife, Sue Ellen, a nurse. When the couple took delivery last summer, instead of removing the 40-footer’s hardtop to ship it by truck back to Maryland, Larry persuaded David and Sue Ellen to make an adventure out of it. Surprised? The “10,000-Mile Tour” was born, launched with a press conference in Anacortes, Washington. We learned then that the boat, bedecked with sponsor’s logos and gelcoat glimmering in the sun, was set to embark on the following itinerary: Inside Passage to Alaska; retrace back to Washington; offshore on the Pacific and around the southern tip of the Baja Peninsula; stay on the Sea of Cortez in La Paz’s Marina Costa Baja for several months; cross, haul out, and remove the hardtop for trucking; truck from Guaymas, Mexico, to Galveston, Texas; reinstall the hardtop permanently, then cruise around Florida and up to Annapolis to exhibit at the Powerboat Show this October. It is an audacious itinerary for the couple, but particularly for David, who had no bluewater experience prior to this trip offshore. He engaged his brother-in-law, Blake Eder, to captain the vessel and to be her caretaker while David and Sue Ellen are away. 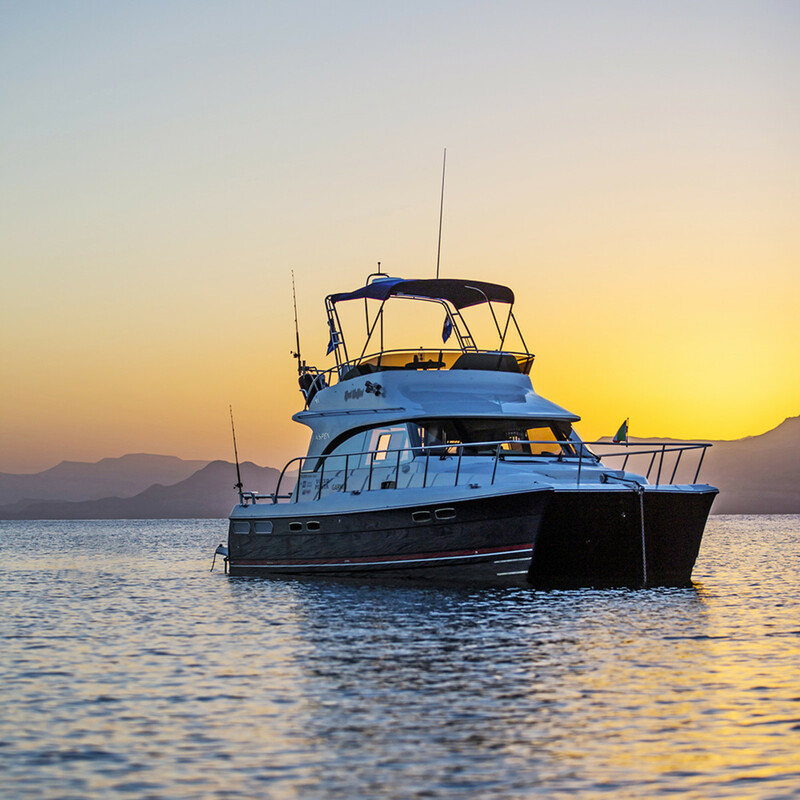 Larry is only a call away if there is a need to move the boat, troubleshoot, or invite members of the media for a cruise, which is exactly why I flew to Baja in November. Nick heading off for a quick paddle around the lagoons on the southern tip of Isla San Jose. We started our mini-adventure at San José del Cabo airport at the southern tip of Baja California Sur, about 40 miles east of Cabo San Lucas. 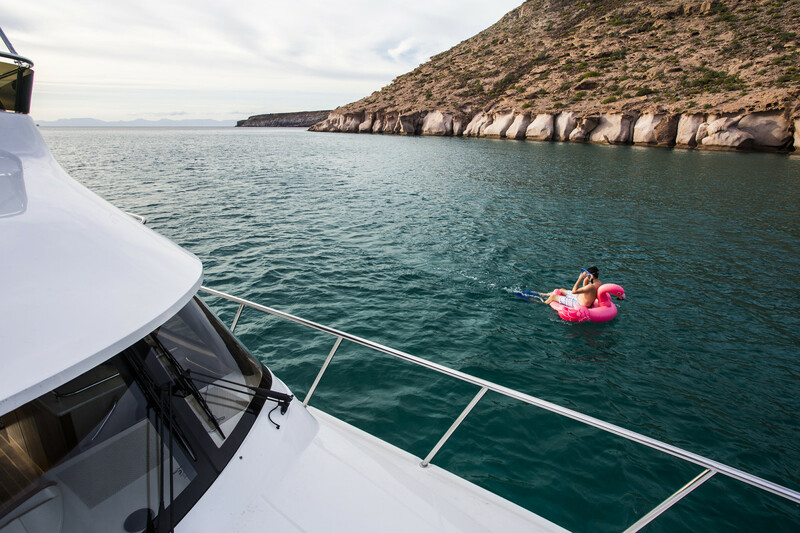 Four of us—Larry, Nick, Northwest Yachting editor Norris Comer, and I—congregated at the Hertz rental center and stuffed our gear into a Dodge Durango in order to make the two-hour drive to La Paz, the region’s capital city. 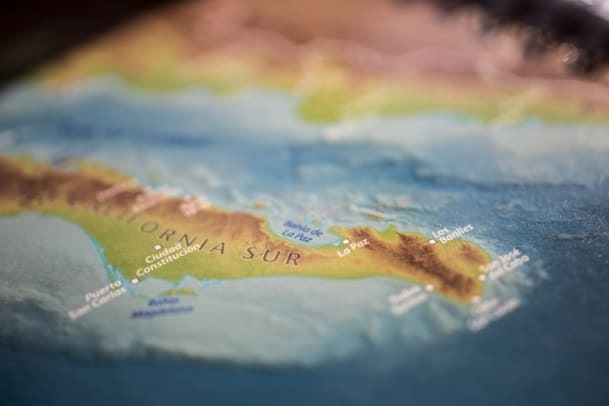 From the airport, the highway sweeps west toward Cabo and then hugs the Pacific shore until the road bends northeast at Todos Santos, effectively crisscrossing the peninsula. 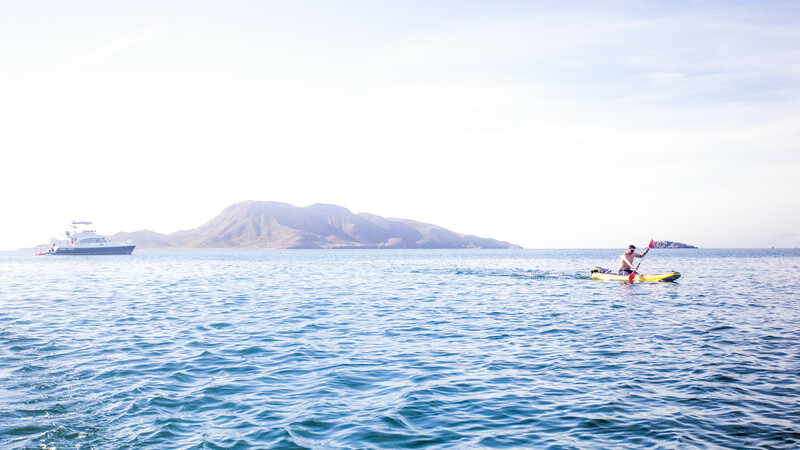 The capital city of La Paz served as our jumping-off point for cruising to the northern islands, which include Isla Espíritu Santo and Isla Partida. Although navigating the maze of downtown streets by car wasn’t easy (lanes undefined, stoplights confusing), Google Maps helped us find the right turns and locate grocery stores, restaurants, and Walmart-type convenience/discount shops (where we purchased necessities, like sleeping bags, cheap sunglasses, and an inflatable plastic flamingo). Norris takes a final quick dunk to marvel at the aquarium underfoot. La Paz’s boardwalk follows a miles-long stretch of beach where wooden fishing skiffs bob on moorings or are left to crack and peel, sunbathing on the beach a few years too long with “Se Vende” painted on their transoms. Fishermen supply restaurants with fresh shrimp for ceviche, a local favorite, and assorted white fish and octopus are common on menus in well-regarded restaurants, such as El Toro Güero (4.5 stars on Trip Advisor). Not to be missed on the walk are several magnificent bronze statues, including an oft-photographed scuba diver. By the time we arrived, Knot Wafflen’ had already spent a few weeks in the region. After supplying the boat with fresh produce and stowing everything that wasn’t ours, we headed up to one of the many restaurants that surround Marina Costa Baja. 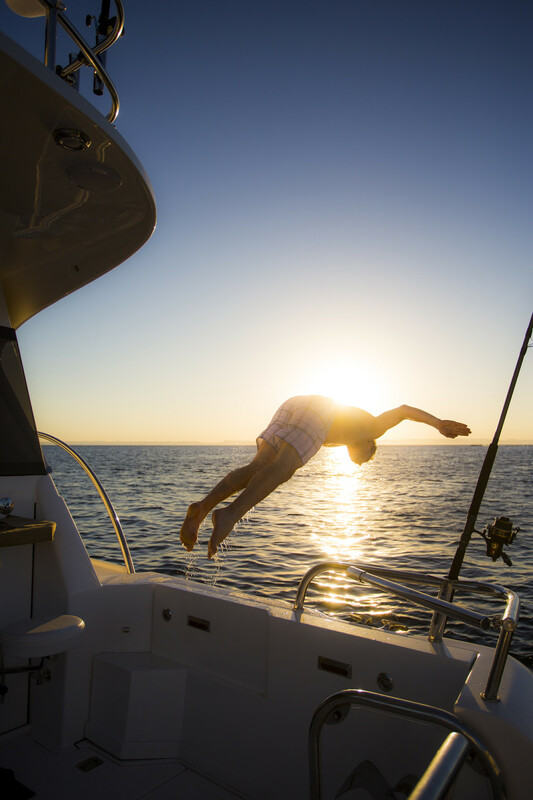 Over dinner and cervezas we loosely established an itinerary, knowing that nothing was set in stone, and enjoyed the 80-degree December evening accompanied by a warm breeze brushing to us over land. The winds stayed calm, with the wildest breezes hitting barely 12 knots, and sea states were never more than a few feet of medium-period swell or light chop. The Aspen is more than adept; both Larry and Nick had the 32 in frenzied seas on the exposed side of Vancouver Island during the Pacific Challenge. 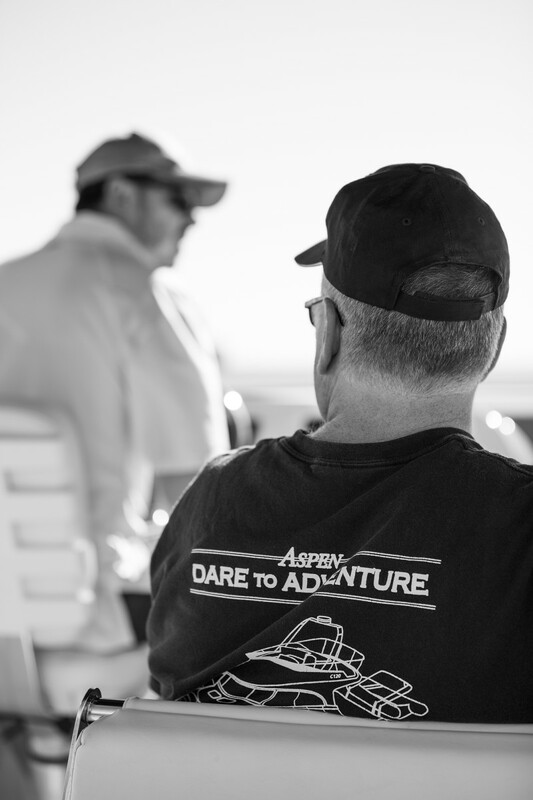 This trip wasn’t going to be a proving ground for what the Aspen can do. Still, we steered from the flybridge in following seas, but even as light as the waves were, you could sense the boat’s ability to handle, as we let Knot Wafflen’ remain on course for over two miles without touching the wheel. All this going 17 knots and burning a fairly meager 12 gallons per hour. Less fierce is Nick’s well-used, inflatable pink flamingo. We stopped first for beachcombing on the white sand of Playa de la Bonanza, where it was a bonanza indeed. 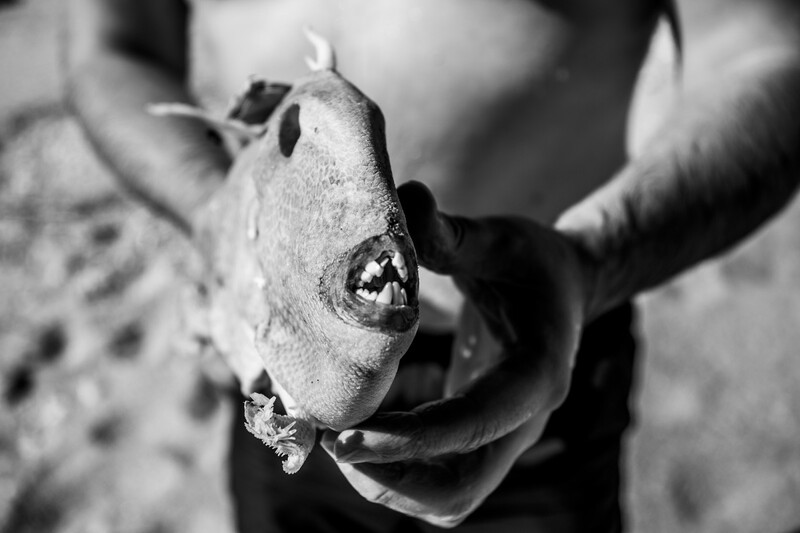 We found the bones of some sort of mammal—there were rumors of sheep or goats on this island at one point—and a host of fierce-looking, snaggle-toothed fish skeletons. The seashells I picked up to bring home for my daughter were so touched by beach erosion that they felt as smooth as pearls. Larry flew his drone around until the gulls grew a little too inquisitive. (This is Larry’s third drone, but he’s definitely getting the hang of keeping it dry.) My other shipmates snorkeled around inspecting the sea life and getting their backs fried by the noonday sun. I walked around the island’s moonscape terrain, and up to the sand dunes, taking great care not to step on the spines of the dead but still sharp fish skeletons. Scallop shell-shape of Isla San Francisco’s anchorage on the west side of the island’s narrow isthmus. Isla San Francisco—about an hour’s run north from Isla Partida—was meant to be a diversion before finding another anchorage for the night. But the postage-stamp island, shaped like a block with a giant fishhook sticking from it, was too difficult to leave. Inside the arc of the bay, boats are protected from northerlies, though the breeze funnels over a narrow isthmus that divides the island’s two mini mountain ranges. 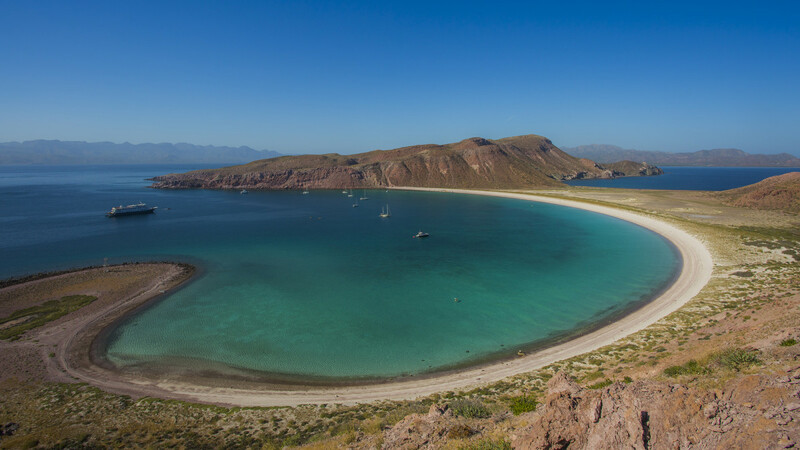 In a southwesterly blow, many of these islands north of La Paz would be less than comfortable for overnight stays, though with enough scope, the anchorages are generally sandy and make for relatively secure holding. A small cruise ship, a couple and their golden retriever on a Nordhavn down from Juneau, and a dozen sailboats were anchored with us overnight. 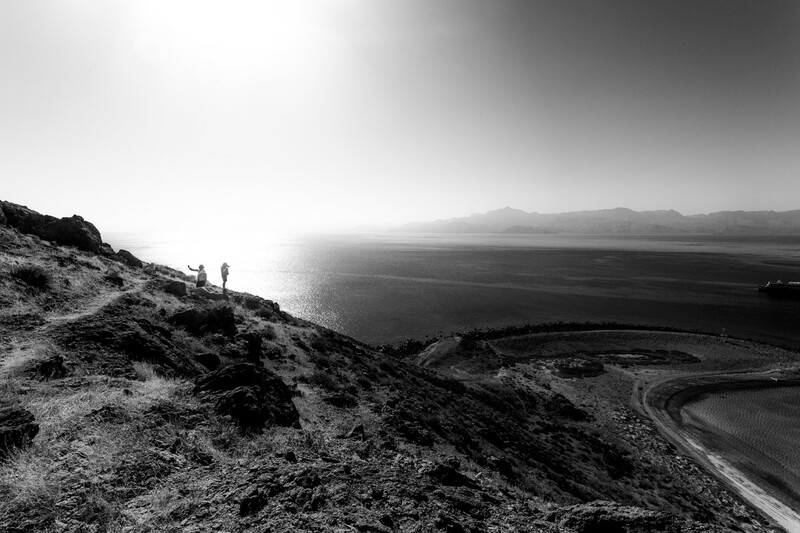 Hiking the hills that surround the anchorage of Isla undefinedSan Francisco. 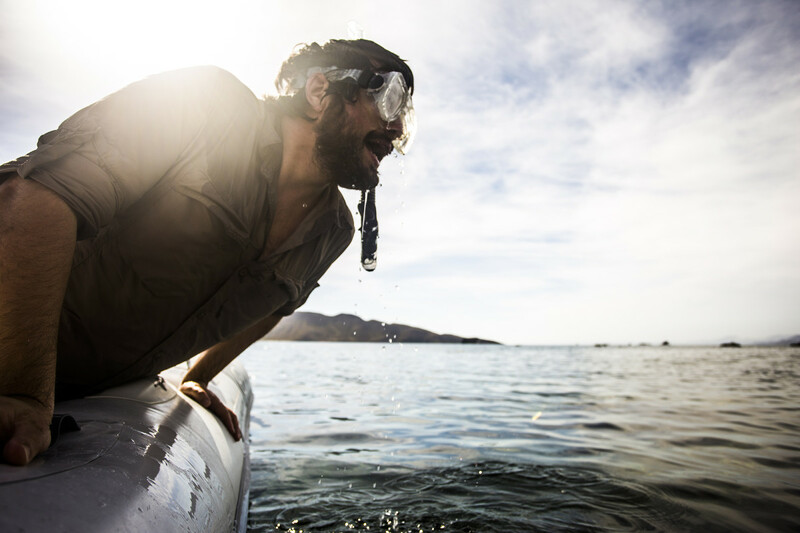 In the late afternoon, Larry patched an inflatable paddleboard. In search of photographs and a little exercise to work off the Coronas, Nick, Norris, and I took the dinghy to shore and hiked up a trail that followed the southern rock face. After lunch (if you could call it that—at this point we had few supplies left other than peanut butter and jelly sandwiches, tortilla chips, and our homemade pico de gallo), Larry and I took the drone to the beach for a little more flight time. Nick takes a moment to dive into the setting sun. Undoubtedly, the highlight for me was waking in the wee hours of morning to the distinct sound of mammals breaching and blowing, frolicking in the shallow bay. In the moonlight, I only caught glimpses from my stateroom portlights, so I climbed up and out into the cockpit for a better view. I never saw one clearly enough to dash my hope that these midnight marauders were vaquitas—the smallest porpoise-like creature on the planet, soon to be extinct—come to thank us for visiting their native waters. After four short days of boating, snorkeling, and fishing, we left Baja behind and began the 2,300-mile flight back to the Pacific Northwest. From 10,000 feet, looking down to where the desert landscape slides into the Pacific on one side and the gulf on the other, it was easy to understand Larry’s penchant for arranging these types of trips. I wouldn’t be surprised to hear that he is busy concocting another pilgrimage, perhaps to some far-off land he’s only ever dreamed of visiting. Perhaps he wants to see if his boats can handle the surf outside Reykjavík, in the dead of winter.